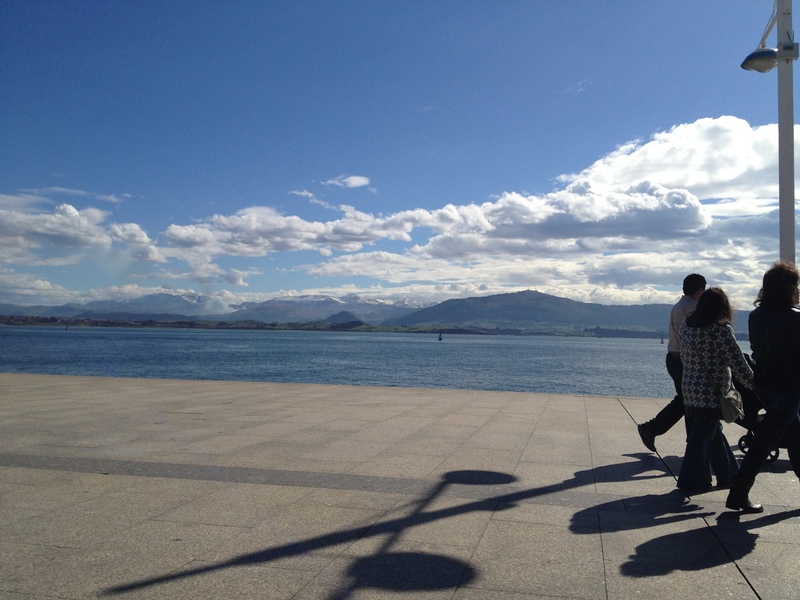 So what’s it like – Santander? You’ve been there for a while. What’s it got going for itself? It’s hard to describe why I would choose to live on the seventh floor of a 1960s apartment block in a city of 180,000 people with my three small kids. But all it takes is a visit – on a sunny day – and there are plenty of these – equally spread across the four seasons. In just one hour you will be won over – by the views from the port, the walks by the beaches and the many great cafes and bars. If you have a few days you can visit nearby villages and towns such as Comillas and Lierganes, and I suppose UNESCO-listed Santillana on a quiet day – and you will really understand why I am here. And if you ventured into the Picos de Europa – just two hours away by car. Well, enough said. But holidays are holidays. What’s it like to actually live here rather than pass through? 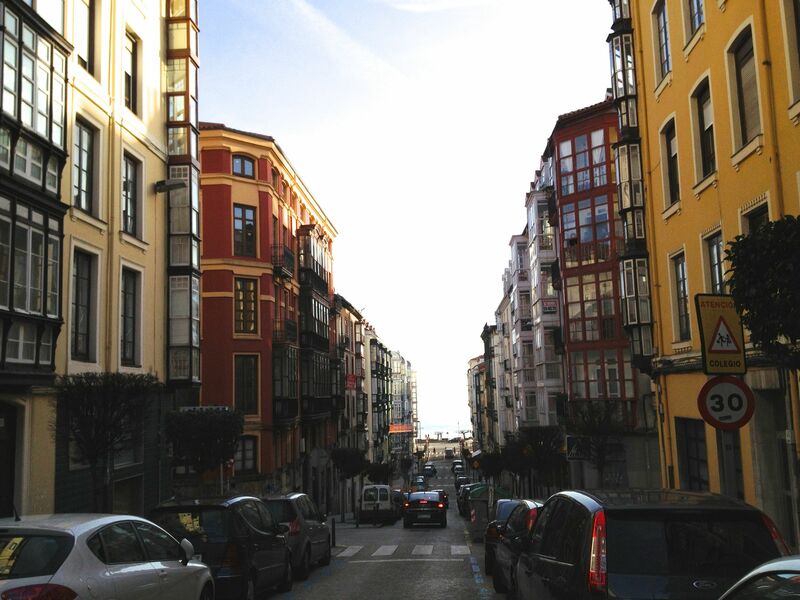 I have lived in three Spanish cities – and each at very different stages in my life so it’s hard to compare. The university city of Salamanca as a 19-year-old ERASMUS student is hard to beat. And Madrid was a fantastic capital to live in – especially as I was really central and had no kids at the time so I could come and go as I pleased. So how does Santander hold up? Very well. 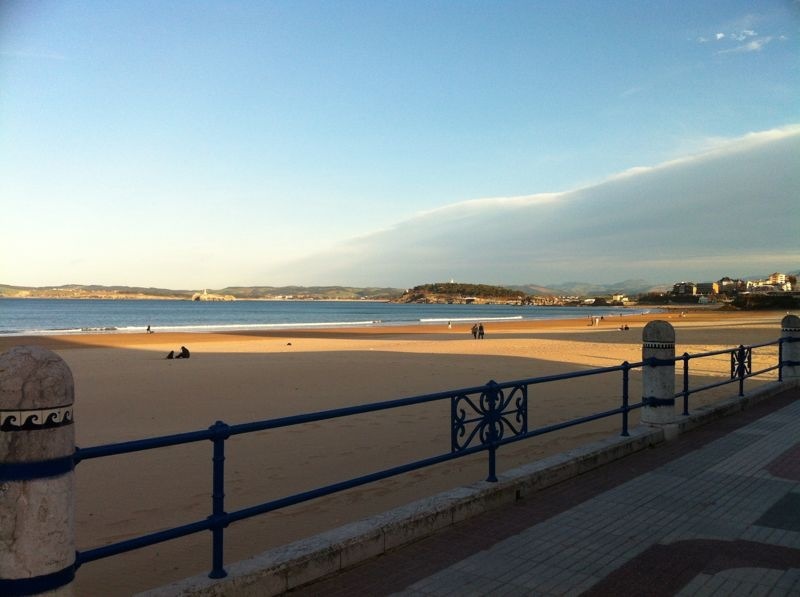 Santander is a great place to live. [Notice I didn’t say work – because that is the hardest aspect of living in this country – the jobless numbers tipped the 5m mark this year in Spain.] So if you are a student, don’t have to work, can telework abroad or are retired, it’s fantastic. 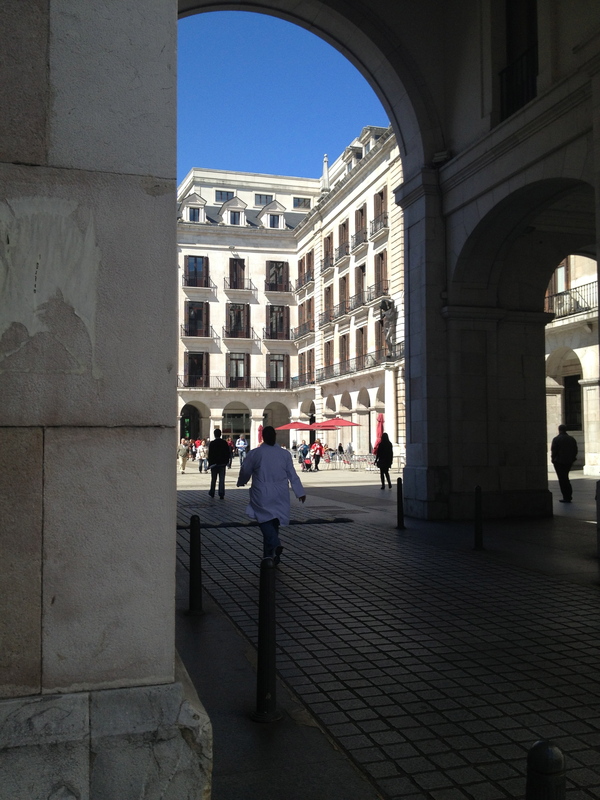 If I think about it – much of what I love about Santander is what I love about urban Spain. Forget the car – that’s something I use at the weekend. If I want fresh fruit or veg, I have about 10 places to go in a two block radius. If I need fish – I go to the fishmonger in the little supermarket below and have whatever I want filleted and boned from 9-2pm. If I’m making some meatballs and need freshly minced beef or pork – I have a butcher a minute away who can prepare whatever I want from 10am-8pm (admittedly with a three hour break in the middle of the day). And if I really want to push the boat out and get some unusual wine, exceptional bread or strange crustacean, it’s a few stops on the bus or a 15-minute walk into the centre that is full of owner-run specialist shops. But wouldn’t a garden be great with three small kids? True – I do think this from time to time – however I have three play areas within five minutes and some specular parks in the greater city area. And of course, there are the many sandy beaches within the city – where the local kids actually live from June to September. Some of them even have playgrounds as well. 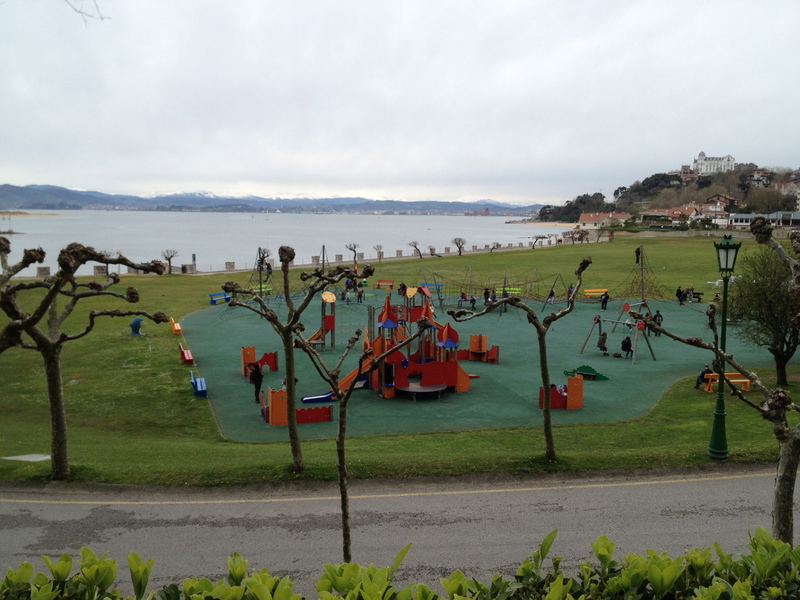 Playground at Palacio de la Magdalena, Santander – taken at siesta-time so it’s a bit quiet! What’s the worst thing about this city? It’s a cruel criticism but the fact that it is surrounded by sea on three sides and to the rear by the mountains can leave me feeling a little hemmed in from time to time – even if it does create a spectacular backdrop. Although I have to add that since Ryanair swooped in a decade ago and started flying to London, Dublin and another 15 places or so, it’s been less of an issue. My favourite season here is Winter. I love it when the Southern Wind – or Viento Sur – is blowing strong. So strong in fact, that many businesses on the seafront close their front doors and send you around the back. This wind drives away all the clouds and offers spectacular views of the nearby mountain ranges. When I get a chance, I love walking along Reina Vitoria and uphill to the Palacio de la Magdalena and then down to the Sardinero beaches – those of you who run would enjoy that pleasure along this route as well. Want to imagine what it’s like to live in my 1960s apartment? My brother Paddy came over and tested his timelapse trickery in the neighbourhood. He filmed at night which is when I think anywhere urban looks its prettiest. Keep an eye out for the kid with the sparklers towards the end – I think I know him. 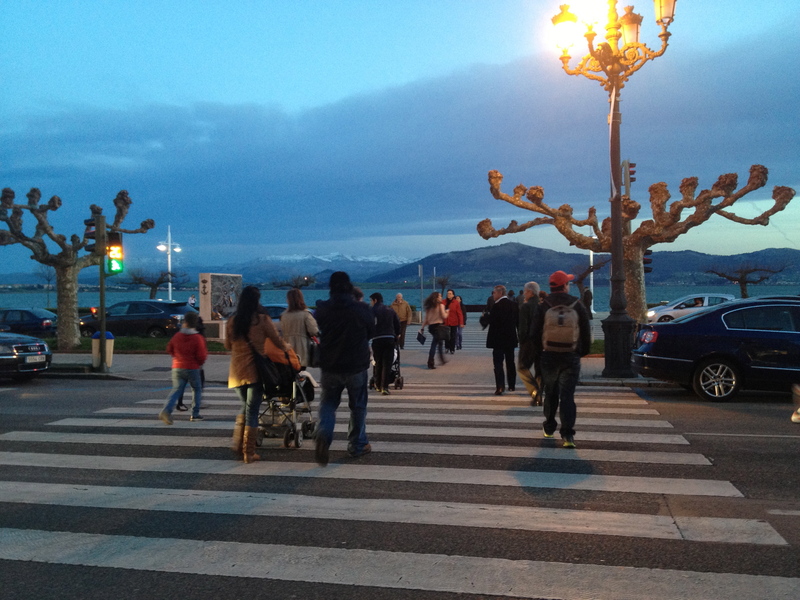 New Years Santander Timelapse from Paddy Cahill on Vimeo. Did you grow up in the city or the countryside? Would you like to live in urban Spain? Hi Pamela, First of all, thanks for following Inside Rioja! Since we’re only a little over two hours’ drive from Santander I hope you will have a chance to explore our region. We love Santander, too! We own a house near Cabo Quintres in Ajo and spend most weekends and all summer there. Of course we visit the city often and enjoy tapas hopping in the bars from Plaza Cañadío down to the area near the train station. We contemplated moving to Santander many years ago to open a wine shop but decided that the city wasn’t ready for it. How times have changed! I’m looking forward to reading your posts as they are published. I’m long overdue a trip to La Rioja and am looking forward to trying out the places on your tapas crawl post in Logroño when I make it there. You sound like you know your way about Santander and Cantabria as well. Interesting that you considered setting up a business in Santander. I’m sure our loss is Logroño’s gain. I’ll keep an eye out for you around these parts. Great read Pam – it evoked so many of those memories of Spanish living and chimed with my inner vacillations (Spanish apart / house with garden?) 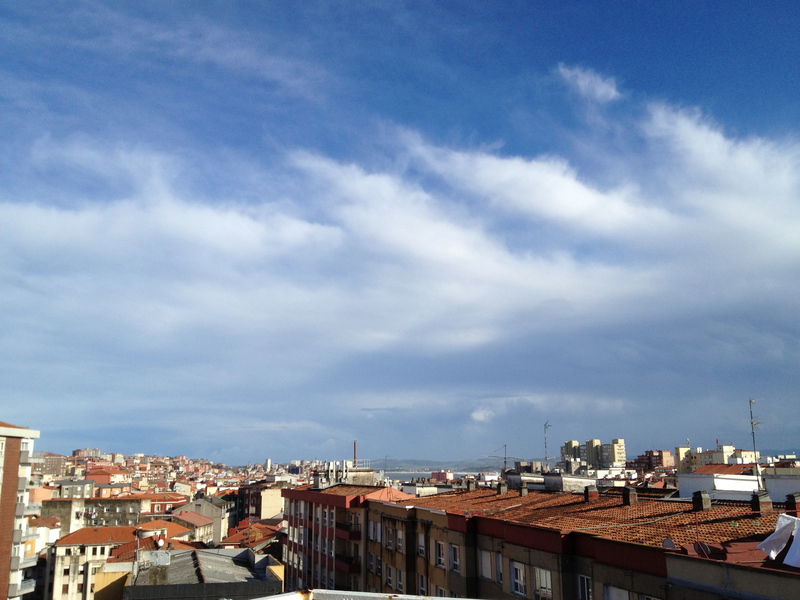 But I’m definitely persuaded towards the Santander urban apartment living – you describe the benefits so well.Great photos too (god making me want to head back to that beach) and a super video by your brother – looks brilliant. Hi Pamela, Beautifully done and very insightful. My wife and I are trying to find a way to move to Spain and we are well underway but are wondering about our childrens education. Our little boy is almost three and our little girl is four and a half. You mention your three small children. Can you tell me about the opportunities and how you feel about the Spanish education system. Unfortunately I have heard quite a number of bad reports /first hand/on our recent trip around the Alicante-Valencia area. Wehave taken these warnings so seriously that we are convinced that we don´t want to move to that region. I was wondering if you can tell me about your experience in Santander. As you can tell I love the city. However, my situation may be a little different to yours as my husband is from here and I knew the area really well before moving here. You didn’t mention work which hopefully means you are highly employable or have the finance to support yourself for a year or more while you look for work or set yourself up in business here.